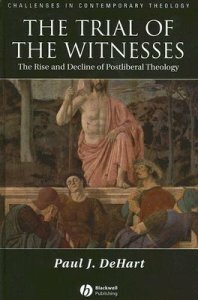 Paul DeHart of Vanderbilt Divinity School recently released his second book, and Blackwell have kindly sent me a review copy: The Trial of the Witnesses: The Rise and Decline of Postliberal Theology (Oxford: Blackwell, 2006), 296 pp. Many of you here will be familiar with DeHart’s first book – a profound and incisive analysis of the theology of Eberhard Jüngel. And this new book, too, is a remarkable achievement, both as a historical study and as a constructive theological proposal in its own right. DeHart has experienced the postliberal controversy at first hand – before teaching at Vanderbilt, he had studied at both Chicago and Yale. And his attempt to make sense of the legacy of Frei and Lindbeck arises from his own personal interest in the question of “how theology can creatively rethink the Christian tradition and yet contribute to the maintenance of its identity” (p. xiii). In many ways, this entire book could be viewed as an attempt to distance Hans Frei from George Lindbeck. The common association of the two colleagues under the term “postliberal” has tended “to merge their different intellectual trajectories, interests, and goals” (p. 54). In particular, the great commotion caused by Lindbeck’s The Nature of Doctrine has “drowned out independent attention to Frei” (p. 32). Frei himself has thus been eclipsed; his own “highly independent intellectual trajectory” has been “well-nigh invisible” to the theological public (p. 40). One of DeHart’s central claims is that the methodological proposals of both Frei and Lindbeck were consistently driven by dogmatic concerns. Lindbeck’s entire project was “dogmatically guided by ecclesiology”: his aim was to articulate “the continuity over time of a people of witness” (p. 58). But through a close and critical reading of Lindbeck, DeHart argues that Lindbeck’s entire construction of a liberal/postliberal dichotomy is fundamentally flawed. In the first place, Lindbeck fails to codify the differences between “liberal” and “postliberal” methodologies. Specific theologians like Aquinas, Rahner, Lonergan and David Tracy simply cannot fit in the categories to which Lindbeck assigns them. Above all, it is Schleiermacher who “lurks … as a troubling presence” behind Lindbeck’s schema (p. 152), resisting every attempt at straightforward categorisation. DeHart also notes the imperceptible move in The Nature of Doctrine from a descriptive account of religious communities to a search for theological norms. For instance, on the surface Lindbeck’s controversy with Tracy appears to be about the proper description of cultural processes; but in fact the whole discussion is haunted by “the theological problem of how to insure the faithfulness of a community to its own identity” (pp. 167-68). This, then, is a radical flaw in Lindbeck’s project. Not only does he fail to categorise adequately any actual theologians, but he “fails to articulate … the real point at issue: competing definitions of communal faithfulness” (p. 168). Further still, DeHart argues that Lindbeck’s distinction between intratextuality (interpreting a world into a text) and extratextuality (interpreting a text into a world) is deeply problematic. Lindbeck’s notion of “intratextuality” presupposes a highly determinate, tightly coherent system of meaning which can unify all diverse instantiations of Christian community; but, in reality, the semiotic networks informing Christian practice are “simply too plural and informal, too contingent and locally constructed” to allow for such a simplistic model (pp. 182-84). Having critiqued the basic dichotomies on which Lindbeck’s proposal rests, DeHart turns to an alert and deeply sympathetic engagement with Hans Frei. For Frei, “the foundational dogmatic datum” for theology is “the narrated individual identity of Jesus Christ in the gospels” (p. 201). Thus his theological vision finds its single focus in a “dogmatic concentration on the unique, personally concrete and scripturally rendered object of Christian witness: Jesus Christ” (p. 142). Frei’s interest in narrative, for example, arises precisely from a christological interest in the capacity of narratives to render the personal identity of Jesus as the Christ (p. 113). For Frei, then, the purpose of theological reflection is essentially descriptive rather than explanatory. Frei does not, of course, wish to deny that the gospel narratives refer to external realities; rather, he is convinced that there can be no systematic way of relating these narratives to non-linguistic realities (p. 204). Perhaps the most profound aspect of DeHart’s study is his analysis of Frei’s relationship to Schleiermacher. Frei’s reading of Schleiermacher, he argues, is at the very heart of his entire theological typology (p. 216). While interpreters have generally assumed that Frei straightforwardly sided with Barth’s dogmatic method against Schleiermacher’s method of apologetic correlation, DeHart argues convincingly that Frei situates proper theological reflection in the space between Barth and Schleiermacher. Barth and Schleiermacher represent the twin dangers confronting all authentic theological reflection: Barth risks intelligibility for the sake of faithfulness, while Schleiermacher risks faithfulness for the sake of intelligibility. These dangers are not accidental; they are in fact “constitutive of theology itself,” so that they “cannot be methodologically neutralized” (p. 238). With this argument, DeHart powerfully destabilises the dogmatic/apologetic dichotomy which has so often been employed in discussions of “postliberal” method. The crucial point is that, for Frei, external discourses must be used non-systematically, simply as “ad hoc” correlations. The Christian semantic network is systematically irreducible: it cannot be translated into or grounded on the terms of any other semantic order (pp. 234-35). This point is destructive of Lindbeck’s entire postliberal project, since postliberalism “is constructed through a blunt opposition between intratextuality and extratextuality” (p. 237). For Lindbeck, external discourses are simply “absorbed” unilaterally into the Christian network – but Frei resists precisely such a reductive model. Ironically, then, in stark contrast to Lindbeck, Frei’s work has highlighted “the church’s semantic investment in its cultural location.” The church’s witness is not “the autonomous application of a codifiable, enduring framework,” but rather “the always unfinished interlocutive process of rediscovering the Christ in light of the ‘ad hoc’ encounter with the church’s cultural sites” (p. 244). On the basis of this reading of Frei, DeHart concludes by offering his own constructive proposal, a practice of “generous, liberal orthodoxy” (p. 279). Theology must be orthodox in its commitment to witnessing faithfully to the scripturally-rendered identity of the resurrected one; and it must be liberal in its commitment to the constant redescription and re-articulation of the resurrected one in correlation to specific cultural contexts. Finally, it must also be generous, since, as witnesses to the resurrected one, we ourselves are always on trial – we are tried and tested in each new engagement with our cultural site. DeHart’s The Trial of the Witnesses is both the most profound analysis to date of the “Yale School,” and a brilliant attempt to rehabilitate the distinctive theological approach of Hans Frei. But, more than that, it is also a highly suggestive and illuminating constructive proposal in its own right – a proposal for the grounding of all theological practice in the church’s fundamental task of witnessing to the divine identity of Jesus as it rendered in the scriptural narratives.